Hasselblad Photograph by Ansel Adams. Only known photographic print to exist based on facts from Center of Creative Photography. Landscape: Cascade on Merced River, Yosemite Valley, CA. Ansel Adams' Studio Stamp on mounting indicates. San Francisco, CA (note: the address is Adams' home photography studio). Signed in pencil by Ansel Adams in bottom right hand corner on the mounting board. Image is Ansel Adams' large format (unusual size) work taken with a Hasselblad camera. 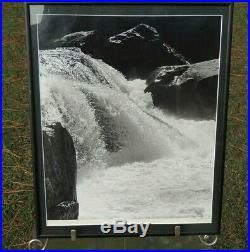 Condition: The pictures show the photograph behind glass. Ansel Adams Gallery curator at Yosemite Valley, Evan Russel, told me that he has never seen this photograph. Leslie Squyres (Head of the Volkerding Study Center for Creative Photography) and Archivist at same researched the history on the negative. Her findings and analysis are as follows. The Ansel Adams' negative log does not date the image. She could not find any instances where it was published. The image was made with a Hasselblad camera. The mount is very typical of all of the Ansel Adams photographs in their collection. The handwriting on the back of the mounting appears to be by Ansel Adams. Note: The Center for Creative Photography archives all of the negative for Ansel Adams photograph. He arranged it this way. So his work could be studied only per Leslie Squyres. Analysis of the photograph by a Fine Arts Professor of Photography at a University in North Alabama. Image size all the way to edge 18 high x 15.5 wide. Top two corners are loosening off mount. The paper has some lifting (becoming unattached) in top left and most of right. Slight curl on edges all the way around. I couldnt find any yellowing on the surface. The photos frame is not sealed so the print has some surface dust that I tried to brush off and it did come off. A In lower right there is a 1 inch indent in picture. B Top left- 3 inch indent-Attached. C Top middle- small scratch. It is a Hasselblad image as confirmed by Leslie and on the back. It is not square so it was cropped. The tonal range is high on the highlights and shadows are dull. Depth of Field is in foreground with background out of focus. The black mat is mounted/glued to the photograph. Note: None of the above takes away from the beauty of the image. I just wanted to give you all of the facts. 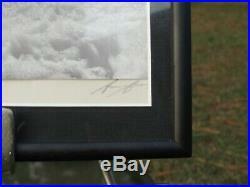 This Ansel Adams one of a kind will not be available again except from the person who owns it. There are no prints and the Center for Creative Photography can't make prints from the negative. 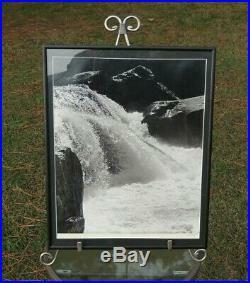 The item "Ansel Adams signed Hasselblad Photograph of Cascade on Merced River, Yosemte, CA" is in sale since Friday, March 15, 2019. This item is in the category "Art\Art Photographs". The seller is "bazile40" and is located in Harvest, Alabama. This item can be shipped to United States, United Kingdom, Denmark, Romania, Slovakia, Bulgaria, Czech republic, Finland, Hungary, Latvia, Lithuania, Malta, Estonia, Australia, Greece, Portugal, Cyprus, Slovenia, Japan, Sweden, South Korea, Indonesia, South africa, Thailand, Belgium, France, Hong Kong, Ireland, Netherlands, Poland, Spain, Italy, Germany, Austria, Bahamas, Israel, Mexico, New Zealand, Singapore, Norway, Saudi arabia, Ukraine, United arab emirates, Qatar, Kuwait, Bahrain, Croatia, Malaysia, Colombia, Panama, Jamaica, Barbados, Bangladesh, Bermuda, Brunei darussalam, Bolivia, Ecuador, Egypt, French guiana, Guernsey, Gibraltar, Guadeloupe, Iceland, Jersey, Jordan, Cambodia, Cayman islands, Liechtenstein, Sri lanka, Luxembourg, Monaco, Macao, Martinique, Maldives, Nicaragua, Oman, Peru, Pakistan, Paraguay, Reunion, Viet nam, Uruguay.